In an interconnected world in which English is the language of business, it’s hard to believe most Latin American countries don’t incorporate it in their curricula until middle school or high school. As Andrés Oppenheimer points out in his book, Basta de Historias, this is one of the factors that seriously limits the economic future of the region and that of its people. Coming from countries where English is not taught in public schools early enough (if at all!) and arriving largely without college degrees at a time when most jobs require some kind of post secondary education, Hispanics are confronted with a double disadvantage. Unless they address it soon after their arrival it affects their ability to progress in the U.S.
Low hourly rates keep them working two or three jobs, which doesn’t leave much time for studying English, keeping them trapped in the same low-level jobs. 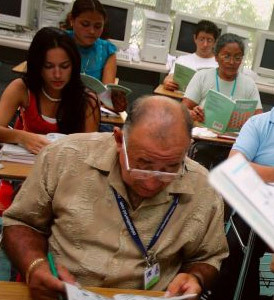 In addition, many Latinos live in close-knit Spanish-speaking communities, which reinforces the idea that English is not really necessary to survive. That may be true if the main goal in moving to the United States was just to survive. But for most immigrants, the reason they left everything behind was to have a better living standard and more financial opportunities. Too often Latinos don’t connect learning the language and furthering their education with better opportunities. But you’re reading this in English. You know exactly what I’m talking about. So, why have I chosen to preach to the choir? Because we all know someone who needs a little nudge to get moving and do something about their language skills, someone who’s always complaining about being stuck. Latinos need to step up their game if they want to have viable jobs and careers for themselves and their kids, and all of us must help to pull our community up. At a time when technology has made it easier for adults to learn English, there really aren’t many excuses left. You can take online courses at whatever time is convenient for you (many of them free or at a low cost) or use applications, such as Voxy (www.voxy.com), which delivers contextual and personalized content through the Internet and mobile applications so you can even learn English while you commute to work. Those of us lucky enough to have an education and to speak English need to continue making this the most relevant issue for our community. And for that to happen, you and I need to do our part daily: We need to advocate for people to learn English and get an education every chance we get. Whether you post messages on your social media pages, provide specific guidance to your neighbor who only speaks Spanish, or offer to practice conversation skills with your relatives who have most recently arrived in the country. Let’s take a page from the book of the Jewish community, which has been successful at educating its members for generations, and assume individual and group responsibility to pull up the Hispanic community. If it takes a village to raise a child, it surely takes a lot more people to raise a community. Mariela Dabbah is the CEO of www.latinosincollege.com and an award-winning, best-selling author and speaker. Her new book El poder de la mujer http://marieladabbah.com/books.htm will be published by C.A.Press (an imprint of the Penguin Group), March 2012. Follow her on Twitter: @marieladabbah and on like her on Facebook: www.facebook.com/marieladabbah.